"Your handshake came over the vastest ocean in the world – twenty five years of no communication." - Chinese Premier Zhou Enlai to President Richard Nixon, Beijing, 21 February 1972. "It was the week that changed the world. "- Nixon, Shanghai, 27 February 1972. With this path-breaking episode, United States became China’s, as He (1994) calls “most respected enemy.” Hence, the question that arises as to how this sudden “leap of faith” came into being on behalf of China, where Mao had continuously condemned the U.S. as an imperialist and an aggressor. How did this engagement come to be constructed such that, upon judging the situation (Soviet Imperialism), China’s policy makers could regard rapprochement with the U.S. as the only reasonable course of action? Conventional approaches to foreign policy analysis and decision-making do not pose this “how” question (Doty 1993). It is generally concerned with “why” particular decisions resulting in specific course of action were made. In answering the “why” aspect there are certain factors that are often ignored or overlooked in assessing foreign policy. Understanding the difference between the “why” and “how” rationalization of actions is necessary in evaluating a successful explanation. Like the question of “why did China normalize its relations with its adversary, the United States?” The most dominant explanation to this stems from Stephen Walt’s ‘balance of threat theory’ , which gives an immediate solution to this puzzle. According to this theory, the Sino-American rapprochement was a result of perceived threat to China from the Soviet Union in the wake of the 1968 Soviet invasion of Czechoslovakia and the subsequent proclamation of the Brezhnev Doctrine, the 1969 Sino-Soviet Border clashes, and ebbing of the American presence in Vietnam (Shambaugh, 1994: 198). As the realists would argue that the perceived threats to China’s national security and the changes in the global balance of power warranted a strategic shift on China’s part. And that the Sino-U.S. opening reoriented China from being a destabilizing to a status-quo power in Asia. Although these explanations rationalize the “why” question, but there still remains a gap in the understanding of the practices that presupposes the ability of an agent to imagine certain courses of action. This is in terms of meanings, subject identities, their interrelationships, and a range of imaginable conduct. Hence, moving from the “why” question to that of the “how”, has important implications for foreign policy analysis. It is this ‘how’ factor that forms the core of the cognitive approach to foreign policy and decision-making analysis. It is the cognitive analyses of the role of the policymaker’s beliefs and images that help in understanding of how the decisions are made. The central questions that form the base of this analysis are- how do policymakers view the world? What affects the beliefs and images of policy-makers have over time? What impact do the beliefs of policymakers have on foreign policy making and the practice of foreign policy? These questions related to the role of cognition help in understanding the formulation and conduct of foreign policy (Rosati 1987). Here, is where the idea of ‘perceptions and beliefs’ in foreign policy and decision-making comes into being. Traditionally, foreign policy has been explained from a rational-actor perspective based on realist and power politics assumptions. And it is argued that since the policymakers, act rationally so it is not needed to delve into the psychological predispositions or governmental foreign policy processing. This overlooking of cognitive factors in realist understanding creates caveats in a complete understanding of foreign policy. It is here, where a cognitive approach challenges the assumption of individual rationality. Where the rational actor perspective assumes individual open-mindedness and adaptability to changes in the environment, the cognitive approach posits that individuals are much more close-minded due to their beliefs and the way they process information and thus they tend to resist adapting to changes in the environment (Rosati 1987). A cognitive perspective emphasizes the importance of examining the individuals involved in the policymaking process as they tend to view the environment differently. Assumptions are the most important variables in understanding the cognitive approach to foreign policy making, and this forms the core in the literature on cognitive understanding of foreign policy. Early studies of foreign policy decision-making with a psychological orientation emphasized the influence of various psychological traits on those involved in foreign policy decisions but, more recently, the emphasis has been on perception, beliefs, cognition, and information-processing. The cognitive process approaches, have attempted, in varying degrees, to map out the belief structures of decision makers and explore the implications of these structures for the way international events are understood and policy alternatives are considered. Studies have focused upon the perceptions of particular foreign policy decision makers. As Holsti (1962) emphasized on the perceptions and choices of groups of persons simulating the roles of foreign policy decision makers. Perceptions of low hostility are self-liquidating and perceptions of high hostility are self-fulfilling. In addition, to organizing perceptions into the meaningful guide for behavior, the belief system has the function of the establishment of goals and ordering of preferences, which is linked to decision-making. Robert Jervis (1976) argues that decision makers would gain significantly if they thought through the basics more self-consciously as perceptions of the world and of actors diverge from reality. While Hermann (1980) reflects on the decision process of national decision groups focused upon particular policy problems. He stresses on the relationship between personal characteristics and foreign policy behavior, in order to explain why governments do certain things in foreign policy arena. Richard Cottam, 1977 (Shapiro and Bonham 1973) has built a theoretical framework designed to highlight assumptions arguing that they underpin more specific policy arguments. While Alexander George (1972) arguing on the same line is apprehensive that too often tactical arguments only mask fundamental premises that are not well-defended. Mintz and DeRouen Jr. (2010), state that decision-makers are not necessarily “irrational” but are limited in their ability to carry out all the steps of the rational model, as factors such as personality and beliefs of leaders, emotions, images, cognitive consistency and others influence and shape foreign policy decision-making. And others like Steven Spiegel (Shapiro and Bonham 1973) have argued that the perceptions and philosophy of key leaders are the most important variables in foreign-policy decision making- they are even more important than bureaucratic interests. And, adding to it Vertzberger (1990) has argued that values, beliefs, stereotypes and attitudes have a direct influence on information-processing, which impacts the interpretation of the political environment. The basic notion that core perceptions, like images of the opponent, affect policy choices is also the primary idea behind the operational code and other efforts to study the cognitive bases of policy making. The cognitive study of foreign policy has contributed to a better understanding of the structure of beliefs in the minds of individuals in a political setting. It also contributes to an understanding of the extent to which policymakers’ beliefs are likely to change over time (Rosati 1987). But this approach has rarely been applied to the understanding of the Chinese foreign policy, more specifically, in assessing how China under Mao Zedong took a giant leap in normalizing its relations with its adversary (U.S.). It is this gap in literature that forms the core of my study. The puzzle is therefore, to solve “how” China under the leadership of Mao changed its foreign policy towards U.S. Moving beyond the rational actor model, the study is aimed at evaluating the psychological factors that came into play in Sino-American rapprochement using the cognitive approach model. Therefore, the objective of the paper is to study the relation between cognition and foreign policy and decision-making. What perceptions led Mao Zedong to drastically change China’s foreign policy towards the United States? Was the outcome the result of a realist calculation of threat or rather a change in the belief system? For Mao Zedong, foreign policy was an integral part of a holistic strategy for “making revolution”. Consequently during the Maoist era, “foreign policy” was not distinguished from “domestic policy”, and the compulsions of state and national interests in “foreign policy” were no less amenable to ideas and value change than were those in the arena of “domestic policy” (Bhattacharjea 1998). It is thus necessary to explore the ideas and perceptions, the methods of analysis, the identification of objectives and the strategies for their realization that dominated the making and implementation of foreign policy” or, what the Chinese called “diplomatic work.” Therefore, the central argument of this paper is that it was Mao’s perceptions of the outside objective world and his rationalization of strategy for making revolution brought about changes in Chinese foreign policy vis-à-vis the United States after twenty five years of estrangement. By “Representation of Beliefs”, Shapiro and Bonham (1973) suggest that beliefs of foreign policy decision makers are central to the study of decision outputs and probably account for more of the variance than any other single factor. Beliefs represent both the congealed experiences of the decision maker and his expectations about the decision environment. In the decision-making process, beliefs act like templates for channeling information and for relating possible policy options to perceptions about the intentions and behavior of other nations, and also to the policy objectives of the decision maker. In this case, it is the belief system of Mao Zedong that shaped the perceptions about the intentions and behaviour of other states (Soviet Union and United States), and thereby, contributed to the policy objectives of China. Mao Zedong's primary concern in Sino- American relations stemmed from his perception of the threat from the United States, supplemented by the episodes of direct invasion from Korea, proxy invasion from Taiwan or subversion through peaceful transition. This fixation led to his amplification of American intentions in 1950 in Korea and again in the Taiwan Straits in 1954-55 and 1958. And the second key apprehension was oriented towards whether the United States would treat a new China at an equal parity. These beliefs and perceptions shaped Mao’s cognitive image of the U.S. as an aggressor and imperial power. Shapiro and Bonham (1973) in their analysis propose that four processes are involved in the when a decision maker is confronted with a new international situation that requires a response from his government: the amplification of beliefs, the search for an explanation, the search for policy options, and the choice of a policy. In the first phase, that is, during the ‘amplification of beliefs process’, the decision maker attempts to put the new international situation into the context of his experiences. This is a process of bringing together various components of the situation with his existing beliefs about the nations and actions involved so that the decision maker can define the situation. In case of China, Mao Zedong’s amplification of beliefs can be assessed in terms of Mao’s own theory ‘on contradictions.’ According, to this phase, it can be assessed that in 1968 after the Soviet invasion of Czechoslovakia, there was a major shift in Mao’s assessment of the primary and secondary contradictions. Soviet Union’s aggression seen as “Soviet Imperialism” became the primary antagonistic contradiction displacing the age old U.S. Imperialism. These shifts in perceptions of the most dangerous rival led to policy outcomes. The beliefs of Soviet Union as an aggressor was strengthened by the 1969 border clash between China and Soviet Union along the Ussuri River on the Damansky Island. This led to spiralling of tensions and security dilemma on both sides. Thus, the perception of Soviet Union from an ally to an adversary gradually strengthened in Mao’s mental map, and amplified his beliefs of Soviet Union as an aggressor. The second phase of decision-making is followed by ‘Search for explanations”, this phase is much more deliberated than that of the first stage. In this stage, a decision maker determines whether he possesses an adequate explanation of what has occurred. This is based on an actor's intention or motivation. The path is a sequence from intention to the consequence or set of consequences that were initially input in the amplification of beliefs phase of the decision process. Once new information has activated concepts in a decision maker's cognitive system, there is a search for further processing. According, to this phase of decision-making, the changing international balance of power had a significant impact on Mao Zedong’s perceptions of the world, e.g., those of a world war. Mao always believed that world war was inevitable and China must be prepared for it as soon as possible, and it should also be prepared for a nuclear war. To protect the Chinese nation, Mao Zedong in 1960s replaced the strategy of leaning to one side with the strategy of the Double Anti, that is, the simultaneous pursuit of the anti-imperialism struggle against the US and the anti- revisionist struggle against the Soviet Union (Khan 2006). And then as the Soviet Union was strongly perceived as the most dangerous enemy to China than U.S. Mao’s policy of ‘double anti’ was changed to that of ‘one-united front’ to contain Soviet Union. Mao’s changing perceptions led to changes in his strategies based on the assessment of ‘who were the immediate and most hostile threat.’ Thus, Mao’s configuration of beliefs was subjective of global dynamics and thereby, substantiated his calculus of power politics in the midst of perceptions and mis-perceptions of the other. Third phase in decision-making is that of “search for options and policy choice”. China clearly faced aggressive threats from the Soviet Union. In view of the worsening of Sino-Soviet relations, especially the armed conflicts along the Sino-Soviet border in 1969, the Chinese leadership realized that China’s biggest threat came from the north. China’s very survival was at stake, and China had to change its fighting with the two fists strategy to escape from this strategically disadvantageous position (Cheng and Zhan 1999). At this quandary, only three policy options were available to Mao to relieve the situation. First, China could alter its communist system to conform to Moscow’s will. Second, China could build itself up to repel an invasion. Third, China could align itself with an outside third party to counter the Soviet threat. With China’s sinocentric attitude, the first option was inconceivable. Rebuilding China to become a major power was already a goal; however progress was not rapid enough to provide security from the mobilizing Russians. China had no choice but to align externally to balance against the looming threat (Vea 2006). Thus, as a result of Mao’s changing beliefs of U.S. from foe to friend, in the early 1970s, Chairman Mao and other Chinese leaders seized the opportunity which was offered by the U.S. government to push forward the normalization of Sino-U.S. relations. China’s leaders wanted to ally with the U.S. and contain the Soviet Union. On the common ground of tackling the main threat posed by the Soviet Union, China and the U.S. established strategic cooperation. Similarly, the US was also interested in normalizing relations with China as the Cold War between the U.S. and USSR was intensifying and the U.S. was deeply involved in Vietnam. So, consequently a secret back channel of communication was opened through Pakistan and Romania, which sent signals to the Chinese that the U.S. was interested in ending its policy of attempting to isolate China. This shows the drastic change in Mao’s belief system and its objective and calculated outcomes. As a result of this psychological changes augmented by physical changes in Sino-Soviet relations, despite China’s reluctance to align with the United States, they extended an invitation to the American ping pong team playing exhibition games in Japan. America’s slow withdrawal from Vietnam eased Chinese misgivings about potential imperialist intentions by the United States. This initial invitation opened the door for a secret visit by Henry Kissinger, America’s national security advisor, to plan a meeting between China’s Premier and America’s President. Three months later, President Richard Nixon met with Premiere Mao Zedong for an historic week-long summit. The Shanghai Communique was the result of their efforts, a document establishing diplomatic relations between the United States and China for the first time since the communist takeover China’s selection of the United States as a partner for an alliance rather than another nation was a carefully planned decision. Generally, the most obvious selections for immediate threat balancing are nearby neighbors. These countries have a vested interest in the security of their local neighborhood and would therefore readily supply military force if needed. However, America’s foreign policy regarding the region was designed to prevent any nation from rising to power again, thus, rendering local alliances too weak for countering the Soviets. America’s military force projection was not the only reason that China under Mao chose to side with the United States. The Chinese believed that America would seize the opportunity to gain an ally against the Soviet Union. The fact that America wanted an entrance into China’s economy was no secret either (Vea 2006). By carefully planning their presentation with that of their cognition, China stood to gain everything from the United States without having to make significant concessions the other way. Therefore, testing Mao’s “leap of faith” in normalizing China’s relations with the United States answers ‘how’ the cognitive pathway led to the decision-making. This clearly suggests that examining the kinds of cognitive adjustments, both in terms of the structure of a cognitive mapping of the international political system and in terms of the stored perceptual histories of past events, result in policy choices different from those that have been actually pursued. This proves that cognitive understanding reflects how various foreign policy actors have actually been responsible for foreign policy choices. Foreign policy choices are made out of perceived thoughts and beliefs built in terms of schemas and historical precedents. Hence, looking into the broader spectrum of “Sino-U.S. Rapprochement” in this broader framework of Cognitive approach to decision-making, it goes beyond the realist ‘state-centric’ objectives. Mao’s decisions were more influenced by his perception of the world. And his actions to meet any national or international crisis were highly motivated by reading in between the lines. As Kissinger (2011) argues, that understanding of the Chinese thought-process draws heavily from the China’s past. He thoroughly traces China’s strategic footprints in the shadow of Sun Tzu and his ‘Art of War’), Zhuge Liang’s “Empty City Strategum”, the strategic game of “wei qi” and Wei Yuan’s “using barbarians against barbarians.” These historical beliefs carved and shaped Mao’s policies vis-à-vis the others. It was his perception of the other juxtaposed with that of his perception of the world that created the niche of his foreign-policy decision-making. Therefore, the shifts in the beliefs brought about shifts in the relations vis-à-vis the other. 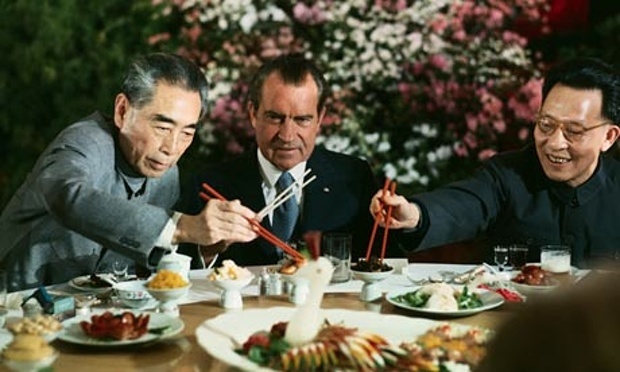 The irony was that Nixon's visit resulted from the fact that China and the United States now shared a common goal, namely resisting the other superpower, the Soviet Union. For most of his life Mao had looked upon the Soviet Union as a teacher and friend, but in his later years it became the number one enemy. Now, as the wheel of history came full circle, the United States was his most respected enemy and the Soviet Union his most hated friend (He 1994). This paper demonstrated that beliefs do matter in foreign policy as decision making rarely conforms to demanding rational choice models and the way in which they shape perceived options. As international relations are fundamentally human relations between people in different states and organisations, understanding the individual decision maker is necessary for understanding foreign policy as a whole. 1.Balance of threat theory states that threat can be balanced by aligning with the aggressor or against the aggressor. The former type is referred to as band-wagoning. By aligning a state with the threat, it buys safety from being aggressed upon. However, such alignments often render a state subservient to their former threat. Band-wagoning behavior typically takes place when a state is drastically weaker than its threat or no alternative alliances can be formed. On the other hand, and the most often seen case, a state will align itself with states that share a common threat. This behavior is called balancing (Walt 1999). 2.The assumption has been that governments and their political leaders think and act in a rational manner in their quest for power and order. Such rationality assumes that individuals perceive the world accurate and arrive at decisions through an open intellectual process: goals are ordered, a search is made for relevant information, a wide range of alternatives is considered, and the option that maximizes the benefits while minimizing the costs is selected. 1.Bhattacharjea, Mira, Sinha (1998), “Mao Zedong’s Vision China, The World and India”, [Online: web] URL: http://ignca.nic.in/ks_41045.htm. 2.Chen, Jian (2003), “The Path towards Sino-American Rapprochement, 1969-1872”, GHI Bulletin Supplement, 1: 26-52. 3.Cheng, Joseph Yu-Shek and Franklin Wakung Zhan (1999), “Chinese Foreign Relation Strategies Under Mao and Deng: A Systematic and Comparative Analysis”, Kasarinlan:Phillippine Journal of Third World Studies, 14(3): 91-114. 4.Doty, Roxanne, Lynn (1993), “Foreign Policy as Social Construction: A Post-Positivist Analysis of U.S. Counterinsurgency Policy in the Philippines”, International Studies Quarterly, 37(3): 297-320. 5.George, Alexander L. (1972), “The Case for Multiple Advocacy in Making Foreign Policy”, The American Political Science Review, 66(3): 751-785. 6.Goh, Evelyn (2005), Introduction: Constructing the U.S. Rapprochement with China, 1961-1974, Cambridge: Cambridge University Press. 7.He, Di (1994), “The most respected enemy: Mao Zedong's perception of the United States”, The China Quarterly, 137: 144-158. 8.Holsti, Ole R. (1962), “The Belief System and National Images: A Case Study”, Journal of Conflict Resolution, 6: 244-252. 9.Hermann, Margaret G. (1980), “Explaining Foreign Policy Behaviour Using the Personal Characteristics of Political Leaders”, International Studies Quarterly, 24(1): 7-46. 10.Jervis, Robert (1976), Percerption and Misperception in International Politics, Princeton: Princeton University Press. 11.Khan, Humayoun (2006), “A historical view of China’s foreign policy towards big powers”, [Online: web] URL: http://catalogo.casd.difesa.it/GEIDEFile/Khan.HTM?Archive=191283591946&File=Khan_HTM. 12.Kissinger, Henry (2011), On China, Great Britain: Allen Lane. 13.Mao, Zedong (1971), Selected Readings from the works of Mao Tse-Tung, Lucknow : Rahul Foundation. 14.Mintz, Alex and Karl DeRouen Jr. (2010), “Psychological Factors Affecting Foreign Policy Decisions” in Understanding Foreign Policy Decision Making, New Delhi: Cambridge University Press. 15.Office of the Historian, U.S. Department of State, “Foreign relations of the United States, 1969–1976,volume xvii, china, 1969–1972, document 203”, [Online: web] URL: http://history.state.gov/historicaldocuments/frus1969-76v17/d203. 16.Rosati, Jerel A. (1987), “A cognitive approach to the study of foreign policy”, [Online: web] URL: http://pluto.fss.buffalo.edu/classes/psc/fczagare/PSC%20504/Rosati.pdf. 17.Shambaugh, David (1991), Introduction: Beautiful Imperialist, Princeton: Princeton University Press, pp. 3-41. 18.Shambaugh, David (1994), “Patterns of Interaction in Sino-American Relations”, in Thomas W. Robinson and David Shambaugh (eds.) Chinese Foreign Policy: Theory and Practice, Oxford: Clarendon Press. 19.Shapiro, Michael J. and G. Matthew Bonham (1973), “Cognitive Process and Foreign Policy”, International Studies Quarterly, 17(2): 147-174. 20.Vea, Matthew (2006), “Analyzing Sino-American Relations of 1972”, [Online: web] URL:http://www.omninerd.com/articles/Analyzing_Sino_American_Relations_of_1972. 21.Vertzberger, Yaacov Y.I. (1990), Introduction: The World in Their Minds: Information Processing, Cognition, and Perception in Foreign Policy Decisionmaking, Stanford, CA: Stanford University Press. 22.Watson, William, Hays (2009), “The week that changed the world”: the rhetorical significance of Nixon’s China rhetoric”, Ph.D. Thesis, Georgia: The University of Georgia.